The political chaos of the Left is plaguing the Clinton and Sanders presidential campaigns. Hillary Clinton was criticized last week for not responding to a “trans-focused” questionnaire sent by Trans United, a political action committee pushing transgender political issues, most notably bathroom legislation. “Given Secretary Clinton’s record of leadership on several key issues impacting the transgender community and the campaign’s commitment to complete the historic survey, members of the Trans United Fund’s advisory board remained disappointed and concerned by the Clinton campaign’s failure to complete the survey,” a press release sent out by the organization last week states. Trans United praised the Sanders campaign for completing the questionnaire. Meanwhile, in East Oakland, California, five activists from Direct Action Everywhere, a radical animal rights organization, rushed the stage during a Bernie Sanders speech. The Secret Service moved to protect Sanders and an activist was beaten with a baton. “He claims to be a progressive, but you cannot be a progressive if you oppose animal rights,” he added. Direct Action Everywhere is opposed to “speciesism” and calls for “total animal liberation.” It has disrupted Sanders events in the past. On two occasions last year, Sanders was shut down by members of Black Lives Matters. The first incident was during a Netroots Nation forum in Phoenix and the second a few weeks later in downtown Seattle. Intimidated by two female BLM activists who rushed the stage and commandeered the microphone, the Sanders campaign called off the Seattle speech. Sanders supporters are also guilty of disruptive behavior. During a Democrat convention in Nevada, Sanders supporters threw chairs and reportedly threatened the state chairwoman in a fight over delegates. In May, supporters promised to disrupt the Democrat convention in Philadelphia this summer. Earlier this year, Sanders supporters invaded a Donald Trump event in Chicago. The Trump campaign canceled the event over security concerns. People for Bernie took to Twitter on Monday and praised the violent demonstrations in San Diego. Thus far, Sanders has not condemned the violence. Remember the #TrumpRally wasn't just luck. It took organizers from dozens of organizations and thousands of people to pull off. Great work. Many if not most of the violent demonstrators in San Diego, New Mexico, and Chicago are political no-nothings embracing what can be described as a “gangsta” street ethic. Attacking police, trashing private property, and assaulting the media does not carry a political message. It is mindless mob violence, often with an overriding racist tone. In April, a resort to “revolutionary violence” (more accurately the violence of racist thugs) was promised if Trump wins the election. Tef Poe, described as a rapper and prominent Black Lives Matters activist, promised racial riots. This is the political incoherence the Left brings to the national debate. The radical Left is not interested in reasoned discussion or political compromise. It is hellbent on violence and destruction in order to impose its political orthodoxy on the American people. Presumptive Republican presidential nominee Donald Trump trails Democratic front-runner Hillary Clinton by 2 points in the latest NBC News/SurveyMonkey weekly tracking poll. Trump, who gained 2 points in the last week, now trails Clinton 47 to 45 percent in the poll released Tuesday morning. Clinton’s results are unchanged since last week. The online poll of 12,969 registered voters, conducted between May 23 and May 29, has a margin of error of 1.2 percentage points. Clinton leads the billionaire by 1 point in the RealClearPolitics index of national polls. U.S. Internet giants Facebook Inc., Twitter Inc., Google and Microsoft Corp. pledged to tackle online hate speech in less than 24 hours as part of a joint commitment with the European Union to combat the use of social media by terrorists. Beyond national laws that criminalize hate speech, there is a need to ensure such activity by Internet users is “expeditiously reviewed by online intermediaries and social media platforms, upon receipt of a valid notification, in an appropriate time-frame,” the companies and the European Commission said in a joint statement on Tuesday. The code of conduct arrives as Europe comes to terms with the bloody attacks in Paris and Brussels by Islamic State, which has used the Web and social media to spread its message of hate against its enemies. The companies said it remains a “challenge” to strike the right balance between freedom of expression and hate speech in the self-generated content on online platforms. “Cause he’s bad,” responds the child. “That’s right,” replies the mother. “We have to kill him,” continues the toddler. “Why is he bad?” asks the father. “Cause he wants to take away our family,” responds the child. “We’re going to kill him,” the child re-asserts. Minors mouthing profanities aimed at Donald Trump are nothing new – many of them have attended anti-Trump rallies across the country, but to hear the parents of a 3-year-old girl encouraging violent rhetoric is a new level of absurdity. Back in December, a street food outlet in Portland called El Diablito celebrated its grand opening by having children batter a Donald Trump effigy. Video footage shows one child shouting, “I want to kill him!” before the pinata is decapitated. As we have repeatedly documented, the media has blamed Donald Trump for violence at his events while continually absolving the very people responsible for such violence – Bernie Sanders supporters – of blame. Surely, no one has thought of this before. Fortunately, Johnson is such a cuck he’s actually attracting more votes away from Hillary than Trump. The most recent Morning Consult poll, conducted between May 19-23, shows Johnson getting 10 percent of the vote. Clinton leads Trump in that poll 38 to 35, with 17 percent undecided. At first glance, it seems that Johnson is hurting Trump in the poll. But Johnson is only getting 6 percent of Republicans in the poll, compared to 7 percent of Democrats, meaning that Bernie Sanders supporters might cancel out the #NeverTrump Republicans going to Johnson. Johnson gets 18 percent of independents in that poll, but Trump still leads Clinton among independents 37 to 19, with 26 percent undecided. In the most recent Fox News poll, Johnson is getting 10 percent of the vote, but that’s not enough to knock Trump out of the lead nationally. That poll, released May 18, shows Trump beating Clinton by three points, 45 percent to 42 percent, in a two-way race without Johnson. In a three-way race, Johnson grabs 10 percent but Trump still leads Clinton by the exact same three-point margin, 42 percent to 39 percent. Johnson steals three points equally from Trump and Clinton. There was a report two weeks ago the Koch brothers are pledging $10 million to Johnson to run as a spoiler against Trump. Despite that denial, a source with a leadership position in the Libertarian Party told The Daily Caller Thursday afternoon that Johnson’s on track to receive the billionaire’s support. “In the event that a Johnson/[Bill] Weld ticket emerges from the convention, a pathway is in place for significant funding from Koch, [Steve] Wynn and other large donors,” the source said. Though the VP for libertarians is chosen by party delegates during their convention, Johnson has been pushing for cuckservative former Massachusetts Gov. William Weld – who is known for endorsing Kasich in the general this year and Obama in 2008. During the libertarian debate last Thursday, Johnson said he thinks of Weld as “the original libertarian” and got loudly booed. Johnson is being used as a tool of the establishment to take down Trump and get Hillary elected, that’s the only reason he’s getting tons of press and being praised by #NeverTrump neocons and Hillary supporters in the media. We have an actual anti-establishment candidate this election – it’s Donald Trump. Donald Trump is not a crazy clown he is a master of persuasion. A Louisiana state Democrat doesn’t want schoolchildren to get anywhere near the Declaration of Independence because it’s racist and unfair. State Rep. Barbara Norton opposes a new bill that would mandate schoolchildren in grades four, five and six to recite a portion of the historic document in the first class of each day. HB 1035 was presented by Republican state Rep. Valarie Hodges and did very well early on, sailing through the House Education Committee. But now the bill has stalled and is possibly dead. “I’m not really sure what your intent is, but one thing that I do know is, all men are not created equal. “Let me finish… and for you to ask our children to repeat the Declaration stating that all mens [sic] are free, I think that’s unfair. Apparently, Norton doesn’t know King’s words as much as she’d like to think. The fact that a bill could likely be dead that would give America’s children a chance to recite the rights afforded to them by our Founding Fathers is a disgrace. But on this Memorial Day, remember those who still fought and died for all of our freedoms despite the dissenters and naysayers trying to tear down its foundations. A group of asylum seekers sexually assaulted numerous women at a free concert in Germany at the weekend in attacks similar to those carried out in Cologne on New Year’s Eve. Three Pakistani men are already under arrest after 18 women filed complaints that they had been improperly touched, fondled and groped during the festival in the city of Darmstadt. Police have said the number of complainants could rise. Between two and three more men are still being sought by police as victims receive counselling and authorities try to cool down rising tensions against migrants in general. The incident had similarities to the attacks in Cologne on December 31 – when a number of young women were targeted in the concourse of the city’s main railway station. On June 6th, a group from the Satanic Temple in Los Angeles will use GPS technology to construct a giant pentagram around the city of Lancaster, which is located in northern Los Angeles County. The goal is to “raise awareness” for Satanism, and it looks like this event has already accomplished that goal. Of course this particular date was chosen because it corresponds closely to “666” and the Mark of the Beast that we read about in the Book of Revelation, and therefore this little group of Satanists will receive some unusual media attention this week. But as you will see below, there are other things that we should be far more concerned about than this. A lot of people are going to get upset about this, and that is quite understandable. Currently in America there is intense competition among various belief systems, religions, philosophies, and ideologies. This competition is expressed openly as different groups and faiths seek to promote their belief systems and win converts to their religion or cause. We live in a free market place of ideas, and various religions like Christianity, Judaism, Islam, Mormonism, Scientology, Hinduism, Buddhism, Satanism, Wicca, and others are free to “evangelize,” even though many of these religions would say that they do not believe in evangelism. Wicca, along with witchcraft and paganism, is currently the fastest growing religion in America. Islam is also a fast growing religion. Christianity, and specifically Evangelical Christianity, is declining faster than most people realize. The reason why so many of these other religions are winning in America is because Christianity is losing ground. As millions of Americans turn away from the Christian faith, they are seeking to fill the spiritual voids in their hearts in other ways. If we want to change that, we need to start representing Jesus Christ much better, and we need to let our light shine much brighter than we ever have before. I wrote a major article about the decline of Christianity in America just the other day, and it has been a major theme in my writing for years. The lukewarm, “me-centered” gospel that most churches are preaching today is not going to cut it any longer. We are moving into a time when our world will be shaken like never before, and global events are going to seem like they are spinning out of control. Millions of people are going to be searching for answers, and the number one topic that they are going to be interested in is Bible prophecy. They are going to want to know if the Bible has anything to say about why our planet has gone completely nuts. This is one of the reasons why I wrote my new book and why I recorded a four part teaching series on the last days down at Morningside recently. If you have not gotten a chance to see it yet, you can view the first part right here. I don’t know if you have noticed, but our weather is starting to get totally crazy. Since the end of last September, there have been 10 major flooding events in the United States. Never before in U.S. history have we ever been hit by so many major flooding events in such a compressed period of time. Six people died and at least two others were missing Sunday after heavy rains in Texas and Kansas caused severe flooding. In one case near Austin, which received nine inches of rain this week, a vehicle with two people was swept off a flooded roadway. Threats of floods prompted authorities to evacuate thousands of prisoners near Houston, and inmates in another prison on Saturday fought with correctional officers after flooding caused a power outage. Tropical Depression Bonnie caused a holiday traffic nightmare on Interstate 95 Sunday after the storm system dumped heavy rain causing road closures and miles-long backups, officials said. The South Carolina Department of Transportation said I-95 Southbound at the U.S. 17 exit, about 22 miles north of the Georgia border, was blocked because of water on the road. Traffic was also partially blocked in the northbound lanes. October: Hurricane Joaquin never makes landfall, but it tracks up the east coast of the United States causing nightmarish rainfall and flooding all over the eastern seaboard. Things were particularly bad in South Carolina, where the governor declared that it was the worst rainfall that many areas of her state had seen in 1,000 years. October: Violent storms in southern California caused flash flooding that buried some highways in “rivers of mud” that were up to six feet deep. Hundreds of vehicles got buried in the fast moving mud, and the lifeless body of one man that had his vehicle completely encased by several feet of mud was recovered only after a few days had passed because that is how long it took emergency workers to dig him out. October: Hurricane Patricia was the second most intense tropical cyclone ever recorded in the entire world, and remnants from that storm caused absolutely horrible flooding in some parts of Texas. The flood waters were moving so fast at one point that a freight train was actually knocked entirely off the tracks. November-December: A “conveyor belt” of violent storms barreled into coastal areas of Oregon and Washington causing nightmarish flooding in many areas. The resulting landslides and floods made headlines all over the country, and it is going to be a long time before the region fully recovers. In early December we witnessed the wettest day in the history of Portland, Oregon, and things were also extremely bad at that time up in the Seattle area. January: The middle part of the country experienced record-breaking floodingas the calendar rolled over from 2015 to 2016. The only thing that people could really compare it to was the great flood of 1993, and Missouri Governor Jay Nixon said that some communities saw floodwaters get to “places they’ve never been before”. Normally, if the middle of the country is going to see flooding like this it is going to take place when the snow begins to thaw in the spring. For something like this to happen in the middle of the winter was absolutely unprecedented. January: On January 22nd, one of the worst east coast blizzards in history slammed into Washington D.C., New York City and other major metropolitan areas. More than three feet of snow was dumped on some areas, hundreds of thousands of people were left without power, and coastal cities all long the eastern seaboard experienced flooding that was described as “worse than Hurricane Sandy“. It is also interesting to note that this storm was known as “Jonas”, which is actually a Greek transliteration of the Hebrew name “Jonah”. Jonah, of course, was a Hebrew prophet that was sent to the capital city of Assyria (Ninevah) to warn that the judgment of God was coming. Well, it turns out that this storm called Jonas also hit our capital city (Washington D.C.) on the exact anniversary of Roe v. Wade and in the exact location where Roe v. Wade was decided. March: Almost two feet of rain triggered historic flooding in parts of Texas, Louisiana and Mississippi. 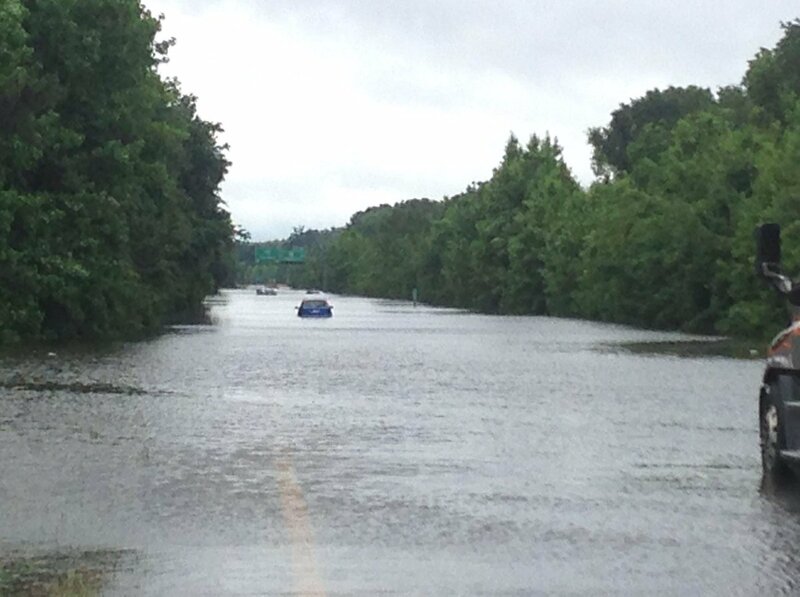 Flooding along one area of the Sabine River broke the previous record by more than five feet, and some sections of Interstate 10 were closed for four days. April: City officials in Houston declared that the flooding that struck that city was “a life-threatening emergency“, and substantial sections of Interstate 10 and Interstate 45 near downtown were fully underwater. Authorities admitted that water was getting to areas that it had never been before, and Fire Department spokesman Jay Evans said that the water was 10 to 15 feet deep in some areas. In addition, let us also remember that 2015 was the worst year for wildfires in all of U.S. history, and right at this moment we are more than a million acres ahead of the pace set last year. So no, we don’t need a bunch of Satanists to curse us, because we are already cursed. We have killed more than 58 million babies since Roe v. Wade was decided in 1973, there are 20 million new STD cases in the United States each year, the suicide rate in this country has spiked to the highest level in almost 30 years, and most of our churches have already gone completely apostate. If you want to get upset about what a small group of Satanists is doing out in southern California, I completely understand. But in the end, we have problems that are far, far greater than that, don’t you think? An influential students’ group has called for prisons to be abolished because they are ‘sexist and racist’ in the latest in a series of far-Left interventions by the student movement. The National Union of Students black students’ conference also voted to step up its fight against the Government’s anti-extremism agenda. The controversial votes at the conference in Bradford this weekend came after the current NUS black students’ officer, Malia Bouattia, was elected president of the union, defeating the more moderate incumbent. She has previously argued that it is Islamophobic to oppose ISIS and described one university as a ‘Zionist outpost’ because it has a large Jewish society. Bernie Sanders supporters in Anaheim attempted to organize a group of protesters to stomp on the U.S. flag while waving the Communist flag, before realizing they were being pranked and threatening to assault YouTuber Joey Salads. “Let’s see if they love America or not,” states Salads before he asks a Bernie supporter holding a “f**k Donald Trump” sign to stomp on old glory. The Bernie supporter and his comrade appear wary but interested. Their main concern isn’t desecrating the flag, but whether the police will arrest them for doing so. The Bernie supporter with long hair then appears to try to attract attention to get a group of people together to stomp on the flag. However, the prank goes wrong when someone tells the Bernie Bros that Salads is a famous YouTube prankster. The Bernie supporters then try to draw media attention to the fact that Salads tried to set them up, conveniently leaving out the part where they were about to go along with it. Unaware that the whole spectacle is a set-up, Trump supporters then get angry with Salads. Salads is chased out of the area by angry Bernie supporters, before returning to retrieve items that were stolen from his bag. “I’m gonna knock you the f**k out if you don’t shut the f**k up,” threatens the long haired Bernie Bro, while still trying to appear like the victim in front of the media. This is not the first time that Salads has been confronted by violent Bernie supporters. In a previous social experiment, the YouTuber compared the reactions to him holding a Trump sign to holding a Bernie sign. The outcome once again illustrated how so-called “progressive” Bernie supporters are in fact deeply intolerant, nasty, violent people.